Jessica is thrilled to be Instructor of Horn at Illinois Wesleyan University and Eastern Illinois University. In 2018 she completed a Doctorate of Musical Arts in Horn Performance and Literature at the University of Illinois at Urbana-Champaign. During this degree she studied horn with Bernhard Scully and also studied jazz improvisation with Jim Pugh. Prior to working on her doctorate, Jessica worked as a freelancer and private teacher in the Chicago area from 2011-2015. Jessica is the horn instructor for Illinois Summer Youth Music where she coaches sectionals and leads masterclasses for junior high and high school horn players. She was recently the horn instructor at the Metropolis School of the Performing Arts, Lake Zurich District 95, and the Midwest Conservatory of Music in Hoffman Estates, IL. Jessica's students have been accepted into the IMEA All-State ensembles and the Blue Lake International Exchange Program. Jessica earned a bachelor’s degree in music performance from Illinois Wesleyan University where she studied with Christine Worthing. 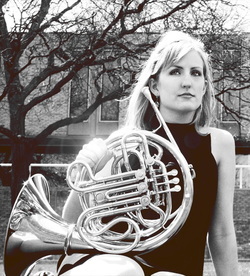 After finishing her bachelors she studied with Adam Unsworth and Bryan Kennedy at the University of Michigan for her masters in horn performance. Jessica has also studied with Neil Kimel of the Lyric Opera of Chicago and David Griffin of the Chicago Symphony Orchestra. You can contact Jessica at jhpearcehorn@gmail.com.